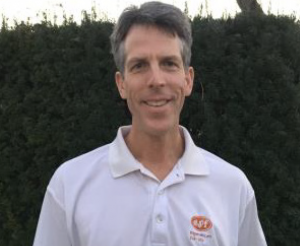 Hi, my name is Greg Ackerman and I am the General Manager for ESF Camps at Georgetown Prep School. I earned a Bachelor of Arts in History from Villanova University in 1989. During that time, I played on the Men’s Tennis Team for 4 years. In 1988-89, I served as Tennis Team Co-Captain and was named twice to the Big East Academic All-Star Team (1988 and 1989) for both athletic and academic achievement. I began working for ESF in the summer of 1989 at The Haverford School in Haverford, PA as Tennis Camp Director. After working in the sales/customer service field, I joined ESF’s Executive Team full-time in January 1994. During the pre-camp months, I worked as Director of Admissions & Enrollment and also did work with ESF’s Aquatics Curriculum. During the summers from 1994-2014, I worked as Site Director for ESF’s camp programs held at Gilman School. In the summers of 2015-2016, I fulfilled this role at ESF’s camp location at Georgetown Prep School in North Bethesda. Most recently, I have worked as General Manager in support for both of the Gilman and Georgetown Prep ESF Camps. What do you love about working at ESF? Working with wonderful people who are so dedicated to the camp, the campers and the work they do. What is your favorite camp tradition? Milestone awards for both campers and team members. What is an ESF fun fact about you? An ESF Team Member introduced me to my wife. I am a camp parent as well as an ESF Team Member.